Whispers in the Loggia: With Madrid, "More Cooperation"
As Rome remains in crisis mode, the Bertone Road Show finds itself in Madrid this week for talks with the Spanish government. Spain's Socialist government and the Vatican on Wednesday announced "more cooperation" despite Madrid's liberal social policies, with Prime Minister Jose Luis Rodriguez Zapatero inviting Pope Benedict XVI to visit Spain in 2010. Future relations would be marked by "mutual respect" and "constructive dialogue," government sources said after Zapatero and Vatican Secretary of State Tarcisio Bertone tried to patch up past differences in Madrid. 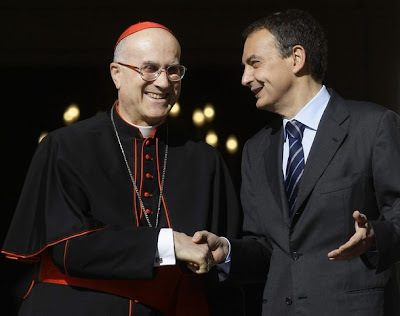 The cooperation could concern areas such as the fight against hunger and inter-religious dialogue, the sources said, without clarifying whether Zapatero and Bertone had discussed touchy subjects such as Spain's plans for a more liberal abortion law. Deputy Prime Minister Maria Teresa Fernandez de la Vega defended the government's liberal policies, reminding Bertone that the Catholic Church was only one participant in a democratic debate. Government plans to reform the current law on religious freedom towards a greater separation between church and state were aimed at adapting legislation to the increasing plurality of Spanish society, government sources quoted Vega as saying. She added that the government had no intention of interfering with the financial privileges enjoyed by the Catholic Church, which gets billions of euros directly or indirectly from state coffers annually. After Zapatero became prime minister in 2004, Spain granted homosexual couples full marriage rights, and has eased divorce laws - in moves that prompted Spanish clergymen to attend massive rallies in defence of the traditional family. The Vatican itself, however, is thought to disapprove of the Spanish bishops' combative strategy, and Bertone had been expected to adopt a conciliatory tone. On the eve of Bertone's visit, the ruling Socialists rejected a string of initiatives from far-left parties that would have highlighted friction with the church. Those initiatives included measures facilitating acts of apostasy by people wanting to renounce the Catholic faith, and revisiting the church's financial privileges. The government is also in no hurry to legalize euthanasia, a move it has been considering. It postponed the presentation of the draft abortion law until after Bertone's visit. "We are fed up," said Joan Tarda of the Catalan republican party ERC, one of the leftist parties that accused the Socialists of giving in to pressure by the church. While next year's freshly-announced Spanish PopeTrip will observe the 2010 Holy Year at the traditional pilgrimage hub of Santiago de Compostela, the pontiff is likewise expected to return again in August 2011 for the next international celebration of World Youth Day in Madrid. Benedict XVI has already visited Spain once since his 2005 election. Beyond his travels, though, one major call for the Spanish church will soon reach his desk: the appointment of a new head of its primatial see, the archdiocese of Toledo, in succession to the global church's newly-named Worship Czar, Cardinal Antonio Cañizares Llovera.